TCTCD started life as a blob in a test tube. We don't really know anything more about what it's made of, as the scientist responsible for its creation literally says (as he sees it growing in the tube): "Great stars! What's happening to the blob I placed in the test tube?" A natural reaction, I suppose...although understandable when your research is on...wait for it...cosmic rays! 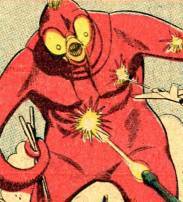 So...blob placed in test tube...cosmic rays turn it into a giant monster...giant monster rampages. As luck would have it, the scientists who witnessed the genesis of the monster happen upon GL, who heads off to halt the destruction. 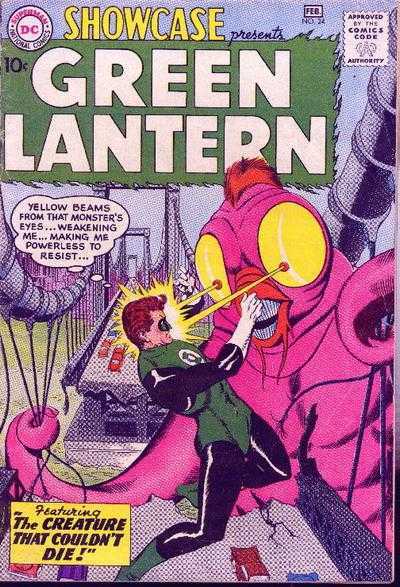 There's a twofold challenge for Hal, though: First, because every Silver Age GL story apparently required Hal to work around his ring's weakness, TCTCD fires yellow beams from its eyes. 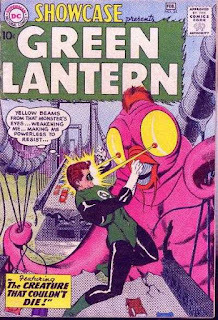 More importantly, though, being powered by a constant bombardment of cosmic rays makes the beast too powerful for even a Green Lantern ring to defeat. I unfortunately didn't come upon this story while I was a kid, because I think that would have been one of those comic book moments that would have stuck with me. It's also a bit unfortunate that, even with that result, GL's encounter with the creature is sort of anticlimactic. Around half the story is devoted to Hal's interactions with Carol Ferris...all that she-only-loves-Green-Lantern-and-how-ironic-that-I'm-him-but-I-can't-tell-her stuff. Sometimes, though, I guess that's half the charm of these old stories. As with last week, I'm not gonna stat this guy(?) up (yet). 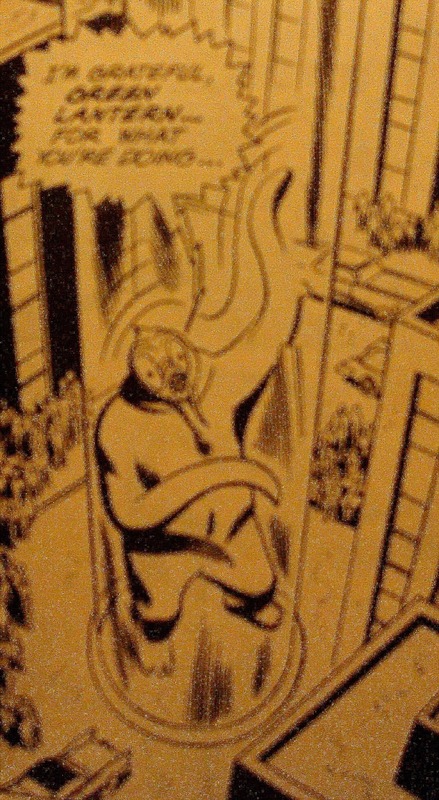 I've been doing a lot of daydreaming about an OSR-based kaiju game, so when I start brainstorming for that here on the blog, I'll work in the Silver Age monsters I've covered. Stats aside, though, I would like to be able to give an idea of how big this thing is...but the scale is pretty tough to figure on this one. Based on the number of floors in the buildings it's next to when Hal defeats it, you could argue that TCTCD should only be about 70 feet tall. In some shots, though, it looks like it's towering over skyscrapers in the Coast City skyline. Maybe it's variable due to the effects of the rays...? For simplicity, when I stat it up, TCTCD will probably stand around 100 feet. That seems like a nice basic size for metropolitan kaiju. 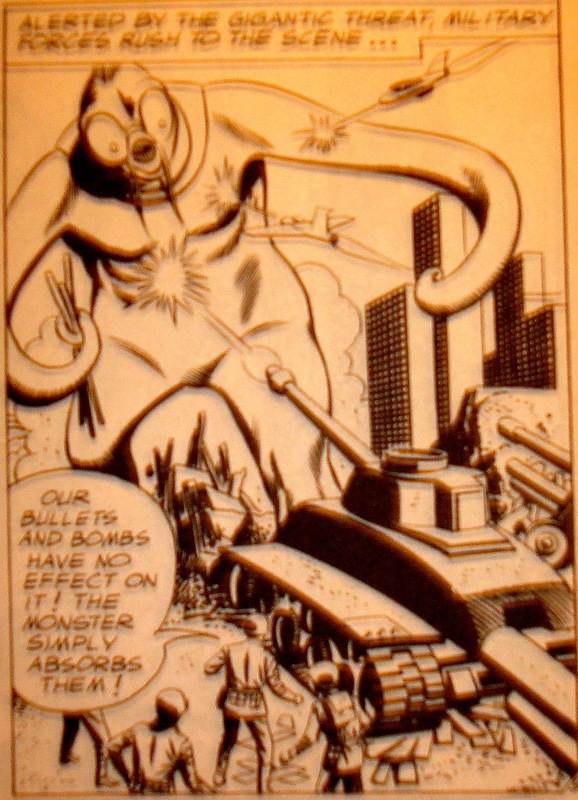 Hopefully, I'll get my #MonsterMonday post up a little earlier next week...and hopefully with another giant creature from the Silver Sixties...! I love reading stuff from the Silver Age. Thanks for introducing this creature to me.